Learn about the temperament and personality of the Puli. Discover what he's like to live with, his traits and characteristics and how he generally behaves. And look at lots of Puli photos. 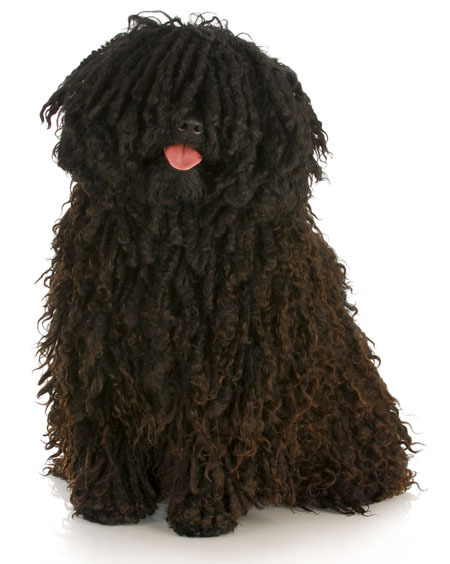 The Puli is an intelligent breed with a sense of humor. They act like puppies for nearly their whole lives. They are active and have lots of energy. They make good jogging companions, and also enjoy hiking, cross country skiing, and camping. They like to spend lots of time outdoors. They love to jump and excel in obedience, rally, and agility competitions. They also do well at herding exercises. In fact, they might try to herd you and your children around the house and yard. They also serve as therapy dogs. These are smart dogs who are easy to train. They want to understand and please their owners. However, if a Puli gets bored, he will get destructive. Sometimes they even chew the hair off their own legs and feet. The Puli is very alert, wary of strangers, and makes a good watchdog. He will warn you if a new car pulls into the drive, if a cat walks across your yard, or if a plastic bag blows onto your property. He is faithful and devoted dog who will insist on becoming a family member. He is family dog, rather than a one person dog. He is an ideal playmate and guardian for children, particularly when he is raised with them. The Puli does not like to be left alone for hours at a time. He would rather help you with activities and come on your outings. He likes to play games and have fun. He is sensitive to people's moods and feelings and shows empathy. However, he will also play tricks on people and can be manipulative to get what he wants. Some owners believe that their Puli is smarter than they are. The Puli is intelligent and quite easy to train. He learns new commands quickly at an above average rate. The Puli sheds practically no hair at all. You'll virtually never find a hair in your home! He requires daily combing and brushing. And he takes a long time to wash and dry after a bath.